Roasted pumpkin is a delicious base for a salad (and lower in carbohydrate than most people think!). If you need a higher carbohydrate option, you could use sweet potato instead of the pumpkin. Combined with feta and crunchy pinenuts, you can have a gourmet vegetarian dinner any night of the week, or a great salad addition to a summer BBQ. Recipe from Super Food for Performance in Work, Sport and Life. Preheat oven to 200 degrees C. Chop pumpkin into small cubes and place on a baking tray lined with baking paper. Drizzle with the olive oil and turn to coat. Roast for 30 minutes or until tender and leave to cool. Towards the end of cooking, place the pine nuts on a baking tray in the over for a couple of minutes to lightly toast, or this could alternatively be done in a small non-stick frying pan on the stove. Allow to cool also. Place spinach in a serving bowl, top with pumpkin, pinenuts and crumbled feta. Whisk additional 2tbsp olive oil, lemon juice and Dijon mustard and season with salt and pepper. Serve salad with dressing. A popular vegetarian soup option, dahl is also one of the easiest and quickest soups to prepare. Red lentils don’t require soaking so you just rinse them and add to your soup. This meal freezes beautifully too, so feel free to make double and keep individual serves in the freezer for easy winter lunches. Heat the oil in a large saucepan or non-stick pan. Cook the onion for 2-3 minutes until soft, add the cumin, garlic, ginger and lentils and cook for 1 minute. Add the tomatoes and stock, bring to the boil then reduce the heat to low and simmer for 20-25 minutes until soft (you may need to add more water/stock, especially if you like a thinner-style soup). Add the lemon juice and process in a food processor if desired. Serve with finely chopped fresh coriander and natural Greek yoghurt. This smoothie is the perfect option post-exercise, containing carbohydrate, protein, antioxidants, electrolytes and fluid for recovery. Rice milk is great to include in smoothies after training for fast recovery, due to its high glycemic index, but dairy milk could also be used. Rice milk doesn’t contain any protein, so we have added protein from yoghurt, almond meal and skim milk powder. You can use a whey protein powder if you like, but you can get enough high quality protein for recovery using real food. This smoothie contains banana and berries, but you can vary the fruit you use to suit your individual tastes. Combine all ingredients and blend, pour into a tall glass to serve. Looking for a protein-packed lunch or easy dinner? Eggs can be prepared in so many ways and this delicious frittata combines the protein from eggs, salmon, cheese and milk to make a filling dish. The salmon adds healthy omega-3 fats plus calcium, so along with the cheese and milk, this dish will help you to meet your calcium requirements. If you don't tolerate lactose well, use a lactose-free milk and mix in some tasty cheese instead of the ricotta. You could also add some leftover roast vegetables, or serve with a delicious big green salad. Leftover frittata is great for breakfast or snacks the next day too! Heat the oil over a low heat in a non-stick fry pan with a heatproof handle, add the spring onions and spinach and cook until the spinach wilts. Remove the pan from the heat and add the drained salmon and crumbled ricotta, stir gently so it is evenly spread over the bottom of the pan. Whisk the eggs lightly, combine with the low-fat milk pour into the pan and continue to heat on low until the eggs are almost cooked, being careful not to burn the base of the frittata. Sprinkle with chopped dill, grated low-fat cheese and salt/pepper to taste then place under a pre-heated grill until the cheese is melted and the frittata is cooked through. Serve with a green salad. This recipe is from my book Eat Right For Your Life. If you love healthy recipes, I have a new book due for release later this year also, all about performance nutrition. Plus don't forget to leave your details here on my blog page so I can send you more recipes and performance nutrition info in the meantime. You can also follow me on Facebook and Instagram, where I put lots of photos of dishes eaten at home and out and about. Nicoise salad is one of my favourites, light but protein-rich and great for an easy dinner on a hot night or a portable and filling lunch. 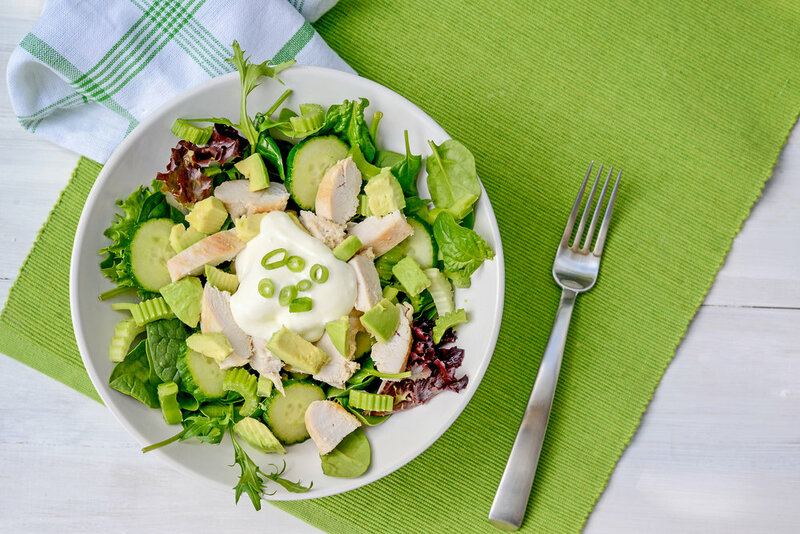 The dressing works well for other salads too. This recipe is from my book Eat Right For Your Life. Combine ¼ cup/60ml of lemon juice with one crushed clove of garlic and 2tsp of Dijon mustard (add 60ml olive oil also if desired). Steam potatoes and beans until just tender, drain and allow to cool. Combine onion, lettuce leaves and cherry tomatoes in a large bowl. Top with potatoes, beans, flaked tuna, eggs, olives and anchovies. Serve with dressing on the side. For more recipes like this, sign up to my free newsletter here. Having a BBQ this weekend? Why not try this quick and easy Mexican beef, a great way to spice up your regular steak. The salad is fresh and filling and also takes very little time to prepare. Perfect for entertaining, or a quick weekday dinner. 1. Combine the cumin, paprika, chilli flakes and olive oil in a shallow dish. Add the steaks, turning to cover in the spice mix. Allow to marinate for 30 minutes. 2. To make the salad, remove the outer green leaves from the corn cobs and BBQ, steam or microwave the corn for 4-5 minutes or until kernels are cooked through, allow to cool. Once cooled, carefully cut the corn from the cob and place in a bowl. Combine the corn, capsicum, red onion, avocado and coriander leaves. Stir through the lime juice and set aside. 3. Grill or BBQ the steak and serve with the sweet corn salad. Note: For the marinade, you can substitute a 35g/1.2 oz packet of taco seasoning for the cumin, paprika and chilli flakes. - This recipe, plus other BBQ friendly meals, is from my latest book Eat Right For Your Life, why not pick one up or order online as a Christmas gift for a food-loving friend! - If you like this recipe, you can subscribe to my free newsletter at the bottom of this page for more nutrition updates and recipes, or follow me on Facebook or Twitter.